Devil World (デビルワールド, Devil World) is a Famicom/NES game released only in Japan (October 5, 1984) and Europe (July 15, 1987). Over two decades later, it was rereleased for the Wii Virtual Console. Devil World is represented in Melee by the Tamagon trophy. The Tamagon trophy from Melee. This is the main character of a Japanese NES game never released in North America. In this quirky maze game, your goal was to work your way through a series of scrolling mazes while battling the cyclopean henchmen of a large, winged demon. Tamagon not only had to worry about the evil creatures, but also the walls, which were extremely harmful. The Tamagon trophy was inaccessible without an Action Replay (or other means of hacking) in the NTSC version of Melee, and was removed completely from the PAL version. "Demon World" (as the English translation of Melee incorrectly calls the game) was listed as "Japan Only" in error, as the game was released in Europe. Official artwork of the Devil in Brawl. 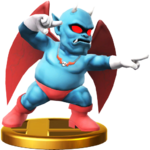 The Devil appears as an Assist Trophy in Brawl. Once summoned, he will fly to the top of the screen and point in various directions. When the Devil points in a certain direction, the camera will move the opposite way, blast lines included. The Devil trophy from Brawl. The NTSC version of Brawl again mistakenly lists the game (albeit under its correct name) as "Japan Only". The PAL version corrects this. The Devil returns from Brawl as an assist trophy, still changing the camera and blast line locations. A devil who holds absolute authority in Devil World. When he appears, he'll fly into the sky as a bat and then transform into his devil form. He'll then begin to point frantically in different directions, scrolling the stage where he points. You're...not really helping things, buddy. A devil who appears to hold absolute power in Devil World. In bat form, it flies to its perch, then turns back into a devil and begins waving frantic orders to make the screen scroll all different ways. Considering that it's an assist trophy, it's not doing much in the way of assisting. This page was last edited on February 24, 2019, at 03:59.